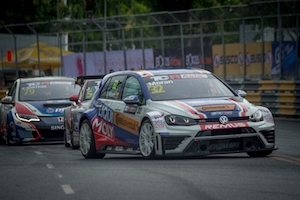 Liqui Moly Team Engstler is back on track with a podium finish today at the TCR Asia Series Round 8 race. 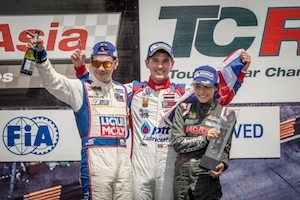 The team regained some momentum after a disappointing race on Saturday to end the weekend with Ecuadorian Diego Moran in second and Thailand’s Kantadhee Kusiri in fourth. The weekend started out well for the team setting the pace for a solid qualifying that resulted in a pole position start for Saturday’s race. "We dominated every free practice with almost a one second advantage. So with the result in Qualifying, we had hoped for a good race result” said Kurt Treml, Sport & Marketing Director, Liqui Moly Team Engstler. “Kusiri secured pole for the first race in the Volkswagen Golf GTi TCR and his fastest lap during the session exceeded all our expectations, showing that he clearly knows the Golf and used his experience of the track to his advantage. “Moran too made good pace and secured a third row start and was in a strong starting position to score points for the team” said Treml. But it was Kusiri’s mistake at the start of that race caused a massive pile up resulting in a red flagged session and costing the Thai driver his race. "It was really dramatic and we are glad that all drivers involved were uninjured” said Treml. 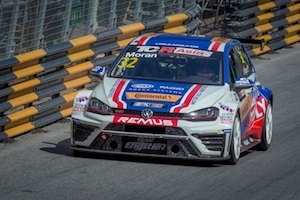 Moran kept his car on track to continue the race and was on pace to attack the third placed man when disaster struck on the last lap, leaving him out of the points. The Liqui Moly Team Engstler crew worked tirelessly after the race to get both cars ready for the second race the next day and both drivers set to work to gain the most that they can from the remainder of the weekend in another dramatic race. At the start of Round 8, Kusiri had to serve a drive-through penalty for the incident in Round 7 and from there he kept his head down and continued to set a steady pace to finish the race in seventh. Kusiri said after the race, “I want to apologise to all competitors for my mistake in the first race. “In the second race and after taking the penalty, the Safety Car period really helped me to close the gap, allowing me to gain two positions to finish the race in P7. I drove a safe race to avoid any risky actions. “Thank you to the team for their hard work to rebuild my damaged car overnight and giving me a great car to race with today” ended Kusiri. Meanwhile, Moran managed to stay with the leading pack through the Safety Car period and gained an advantage from the closer pack. He kept his head down, raced a consistently steady pace and went on to cross the line in third. “I did my best to race a safe race too and I just kept waiting for my chance. It was my first time here in Bangsaen and it has proven to be a very tricky circuit. “At the end of the day, despite the difficult weekend, I am quite happy with the podium and I am looking forward to the next race in Shanghai where we will once again fight for the title” said Moran. The Series will continue with another two round race weekend at the Shanghai International Circuit, China on the 26th – 27th August 2017.